Devil’s Point Wind Farm is an integral part of the continuous renewable energy development in the Republic of Vanuatu. Efate Island has limited road infrastructures and lifting substructures, along with a weak grid which can only withstand a maximum 12 MW. For these reasons, UNELCO, a subsidiary of the Suez/EEC group, chose to partner with Vergnet, a renewable energy manufacture with over 25 years’ experience in delivering projects with limited electricity infrastructure in isolated areas. In 2015, the Vanuatu archipelago, which is made up of 80 islands, was hit by Cyclone Pam, a category 5 storm with gusts exceeding 320 km/h. The GEV MP C medium-power wind turbines at Devil’s Point were not damaged by this cyclone as they were specifically acutely designed by Vergnet to withstand hurricanes by lowering its blades to the ground. The first Vergnet GEV MP C was installed in July 2007 to gauge the wind potential of the site and to analyse the performance and results of the wind turbine, and its influence on diesel electric groups, which are the main electricity source on the island of Efate. The results from the first wind turbine were very promising, prompting UNELCO to contract for ten new GEV MP C in 2008 and an additional two in 2014. Currently, the Devil’s Point wind farm consists of 13 wind turbines, producing 3.6 MW of total power. 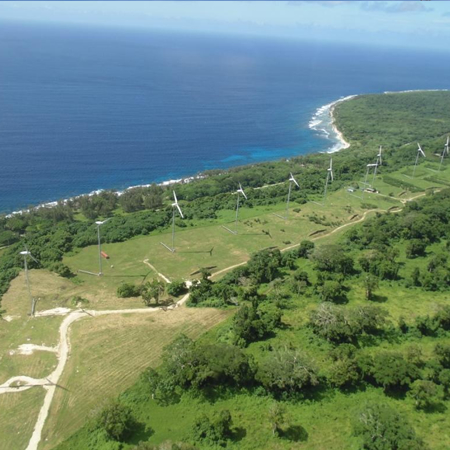 The wind farm reaches approximately 43% wind penetration rate (70% instantaneous) on the Efate Island’s grid. Vergnet carried out thorough training of on site staff to ensure UNELCO could be self-reliant with regards to operations and maintenance of the wind farm. The Republic of Vanuatu has been undergoing renewable energy development and Vergnet are proud of the success of the wind farm at Devil’s Point. With difficult conditions to consider, Vergnet adapted and designed the medium power wind turbines to suit the challenging climatic conditions on the island of Efate, which have proved their efficiency to withstand strong storms and hurricanes , as demonstrate with Cyclone Pam. The 13 wind turbines are producing a total power of 3.6 MW, contributing to the main electrical source on the island of Efate.